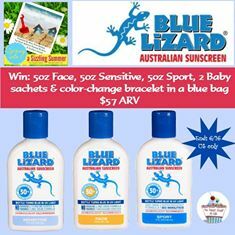 Sunscreen is so important, now you can enter to win a prize package from Blue Lizard Australian Sunscreen! This is a $57 value!! Blue Lizard was formulated to protect you against the burning UVB rays and also against harmful UVA rays. UVA rays cause sun damage that is most associated with aging and melanoma, the deadliest form of skin cancer. Not all sunscreens have this capability. All of our products are broad spectrum, a which is very important in terms of skin safety. Blue Lizard sunscreen has an SPF of 30+ and contains at least 6% Zinc Oxide. There are several dermatologist recommended formulas that cover the entire family. Be sure to read Mom Does Reviews’ full review to learn more! Here is a coupon code just for our readers! Use code P20MDREV for 20% OFF orders over $35. (Expiration 8/31/15). 5 oz Blue Lizard FACE, 5 oz Sensitive, 5 oz SPORT, 2 Baby Sachets Samples, and a color change bracelet with bag that will reveal a change when exposed to harmful UV rays. 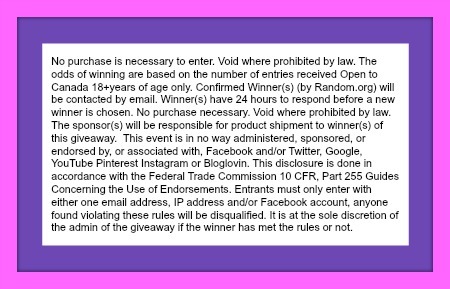 The giveaway is open to US residents, 18+ and ends on 6/16/15 at 11:59 pm ET. 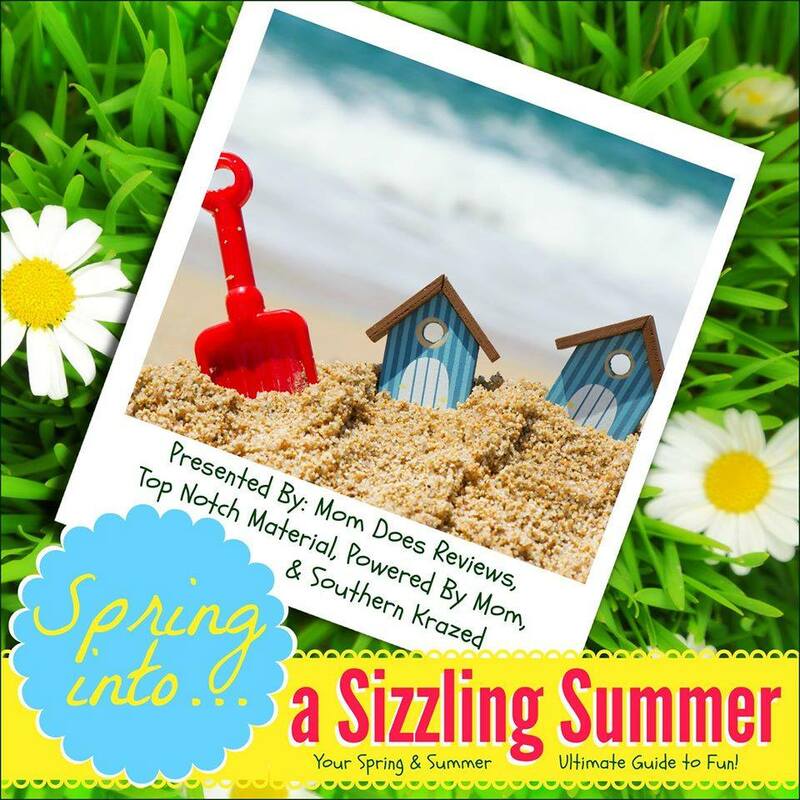 This Spring into a Sizzling Summer event is brought to you by Powered by Mom, Southern Krazed, Mom Does Reviews, and Top Notch Material . Check out all of the other Sizzling Summer reviews and giveaways! We have joined together to share with you the hottest products and must haves for summer! I would like the BLUE LIZARD AUSTRALIAN SUNSCREEN SENSITIVE because my son is sensitive to a lot of products. I would use the blue lizard sensitive. Since I have very sensitive skin, I would use Blue Lizard Australians Sunscreen Sensitive. Everyone in my family has sensitive skin, so I would use that product. I would use the BLUE LIZARD AUSTRALIAN SUNSCREEN SENSITIVE the most. Would use the blue lizard sport sunscreen. I would use the BLUE LIZARD AUSTRALIAN SUNSCREEN SPORT the most. I would use the Sensitive formula for myself, and the Sport formula for my hubby and boys! I would use the Sport version for my family as they would use it while at the beach or swimming…making water resistance important. I would use the Sport sunscreen the most. I would like to use the SPF 30 for face. We don’t use much sunscreen until we get a great base tan. So, we want spf 30. We’re in and out of the water a lot and this will stay on great, too. I would use the Sport one the most, because my family is a very active one and it would be beneficial to us! I would like BLUE LIZARD AUSTRALIAN SUNSCREEN SENSITIVE GALLON – I had no idea you could get it by the gallon – wowie! I would get the Face Sunscreen. Blue Lizard Australian Sunscreen Regular! I would use the Face Sunscreen the most! I would use the blue lizard baby sunscreen the most to protect my babies! I would get the baby spf 30 formula. Just use basic 30 sunscreen.